Shrouded in serenity, the only sound is the soothing one of water trickling off the paddle as it dips rhythmically in and out of the Chobe River, interrupted only by the calls of different birds. Then comes the melodic hum of my guide and poler’s voice as he knowledgeably explains the interesting facts about the surrounding flora and fauna. B.B. 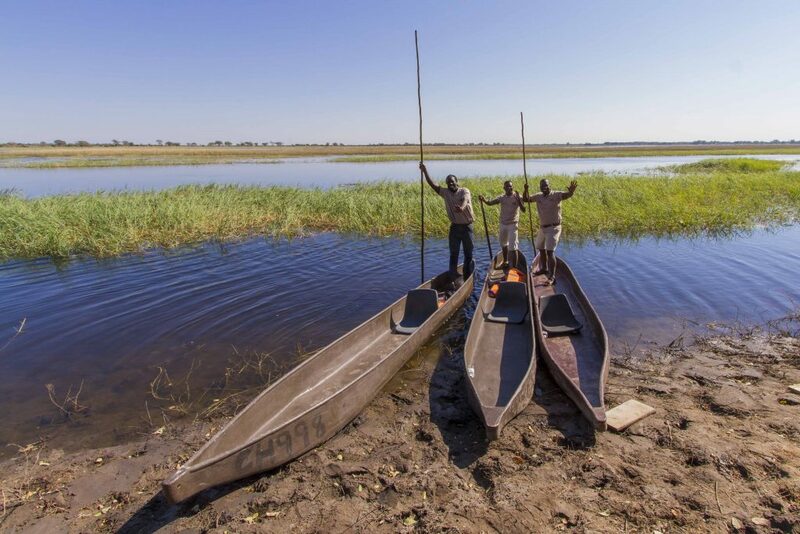 is paddling me gently down the Chobe River in a mokoro, a traditional dug-out canoe, although in a bid to preserve the ebony forests of Botswana, the boats are now made of fibreglass. Innocent Kealotswe started Thaoge Polers Safaris last November, which is a first on the Chobe River on the western side of Chobe National Park, in northern Botswana. Innocent comes from the Okavango Delta, where mokoros are commonplace, and he started poling at the age of 8 or 9. “I had a dream about a mokoro … I asked myself, why should I not introduce a dug-out canoe here, and so I came up with the plan,” Innocent says. 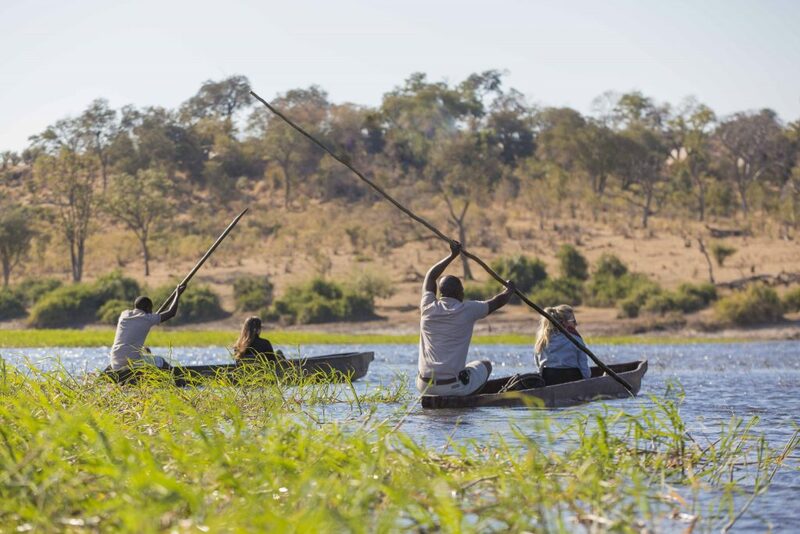 The operation, which is an optional extra activity for guests staying at Ngoma Safari Lodge, as well as any individuals wishing to enjoy a couple of quiet hours on the river, is managed by local Chibeya “Chips” Longwani, who, along with B.B, is also a guide. The year-round activity, which offers an unrivalled opportunity for a close-up experience of river life, takes groups of up to eight guests at a time from a site near Ngoma Safari Lodge, 3 or 4km along the Chobe River and back again. The Chobe River divides Botswana and Namibia, with the Botswana side being renowned for its wildlife, while on the Namibian side is pastoral land, so the sight of cattle and fishermen is common. “On the other side is Namibia, beyond those big trees there are some fields where Namibian people do farming, they will be farming maize meal, sorghum, watermelon and so on,” B.B explains. Along the river, B.B begins naming the birds – a tawny eagle perched atop an umbrella thorn tree is our first sighting. “The tawny eagle has got good sight, so the guinea fowls are its main prey, and sometimes it even eats other small birds,” B.B. says. Soon, in this bird paradise, we see Egyptian geese, African palm swift, African jacana, grey heron, yellow-billed stork, pied kingfisher and even pelicans, to name a few. Then we see a lilac breasted roller, which used to be Botswana’s national bird, but has now been replaced by the kori bustard. We then we start to see plenty of the country’s national animal, the zebra. It is July, so the zebra have started returning to the area, from the Makgadikgadi Pan, and further afield, to graze the soft green grass that springs up as the Chobe River subsides after the rains. They are part of Africa’s longest – and lesser known – land mammal migration, with many walking from Namibia to Botswana, nearly a 500km round trip. Waterbuck and red lechwe also take advantage of the soft green grass, and ahead of us a large crocodile suns itself on a muddy bank close to a flock of reed cormorants, as we approach, it slips lazily into the water and swims off in the other direction (fortunately!). We reach a herd of waterbuck which shy away on our approach, before turning around and meandering back towards our starting point. B.B. 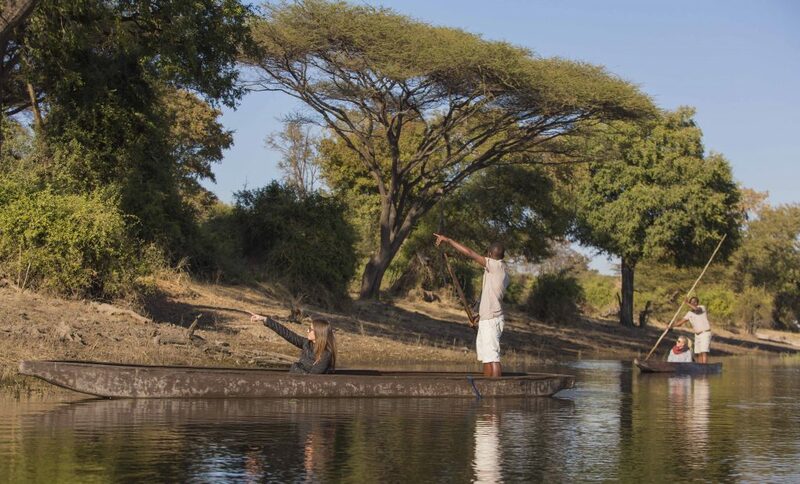 talks of the water lilies whose roots are a popular dish for the Botswana, and he points out the tall jackal berry tree, whose fruits are also a favourite. After a relaxing two hours, the mokoro trip comes to an end, and we step onto terra firma feeling rejuvenated by a unique and close-up encounter with nature.